House Bill 56 (the same anti-regulatory bill that repeals the hugely successful plastic bag ban in the Outer Banks, and promotes other atrocities on environmental rules) was hastily rewritten this week to fund the Cape Fear Public Utility Authority and UNCW for studies relating to the Chemours' contamination, but there was no funding set aside for of our Depts. of Environmental Quality and Health and Human Services. It passed the Senate Wednesday July 30 and then the General Assembly on August 31, after giving the public half a day's notice -- and that short notice was only provided through actions by Rep. Deb Butler and others who stopped the legislature from cramming it through over night without any public notice. The bill now heads to Gov. Cooper's desk, but a veto would likely be overridden. 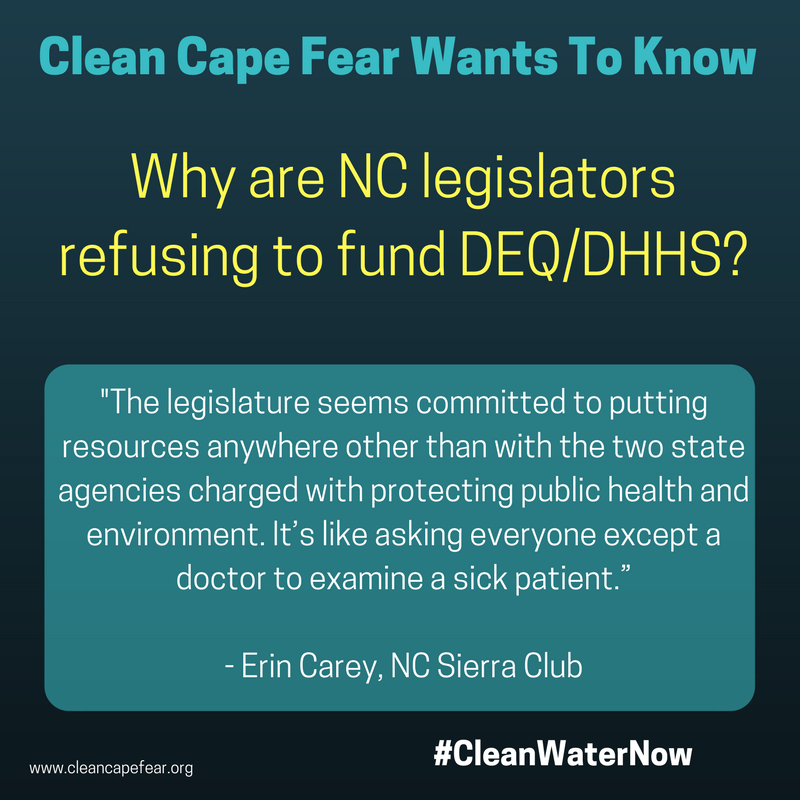 The fact that our legislature denied immediate funding of our regulatory agencies should make one question whether our legislature cares more about ensuring that corporations like Chemours can pollute -- unmonitored and unregulated -- than they do about environmental and human health.